Moved from nirensei v nirensei. DaveSigaty: I think we can show that it was more than just fashion that turned Black to other lines. Here is the Kombilo result for a search of the GoGoD CD for the years 1995 to date (July 2002). Overall, and individually in each of the major lines, White is able to equalize or demonstrate a winning percentage. Charles Matthews OK - but as long as we're talking about fashion, I'd like to look at the statistics critically. When a pattern is coming in and being researched (especially in the intensive way typical of Korean pros), you see the top players using it. But when it's dropping out of fashion you see the top players looking elsewhere, so that their private research can pay off - it would tend to be the lesser lights who persist with it. So maybe one does expect the winning percentage to vary quite a bit over a cycle of the 'arms race'. DaveSigaty: Well I think this is a Chicken and Egg situation to some degree. Do changes in fashion result in changes in results or do changes in results result in changes in fashion? I think that this is something that the databases can answer in ways that have not been readily available prior to about a year ago (release of GoGoD CD and gobase becoming available to the general public). Remember that these databases are heavily biased toward title matches and the major title preliminaries. I think but can not yet demonstrate that fashion follows form to a greater degree than the opposite. We are looking at top-level professional players. Naturally they have their own feelings and opinions. But they also make their living by playing Go against each other. I imagine that they can be very pragmatic when it comes to looking for an edge. When I look at the list of recent games returned by GoGoD CD from a search on nirensei v. nirensei I see that in 2001-2002 the black players include: Rui Naiwei, Yamashita Keigo, O Rissei, Takemiya, Cho Chikun, Yi Se-tol, Pak Seung-hyeon, Cho Sonjin, Yi Ch'ang-ho, amongst others. I would not characterize this as the second-rate list :-) I think that the advent of databases provides a very exciting way of watching the dynamic development of fuseki theory in a way that has never been possible before. We have not yet scratched the surface of what they can reveal to us. Charles Matthews I'd agree with what Dave is saying here. Charles Matthews Having done a great deal of work with paper records in the past, I'm very grateful for the convenience of getting results in a few seconds. But it's quite true that it brings major challenges in its train, in the way of interpreting what one sees. That also reflects back on the good questions to ask. There is also the point that the branching factor in well-known opening positions is five or six, typically. 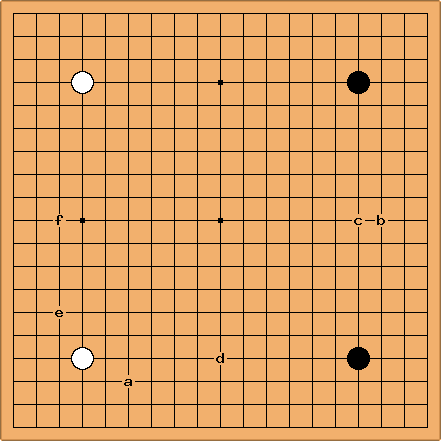 (Which compares with two or three, in complex joseki.) The exponential growth simply eats up the data.